Being a polishaholic AND a shopaholic, it's quite rare that a polish takes me by surprise, but that was my introduction to Muy Caliente. 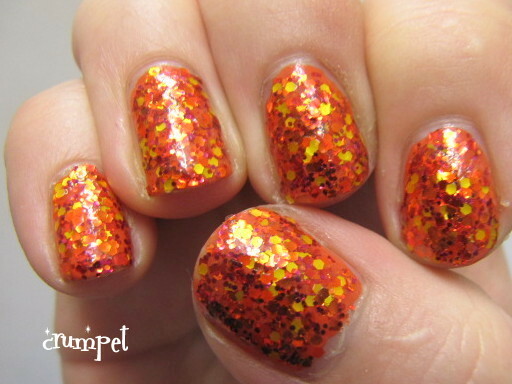 There is something VERY special about this polish. 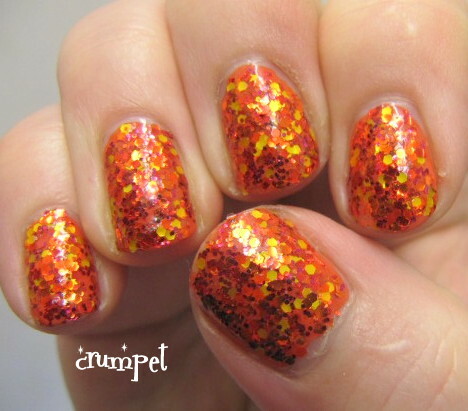 All summer, I've been drawn to brights and fire colours, and this polish is just a thesaurus of everything fire-related! 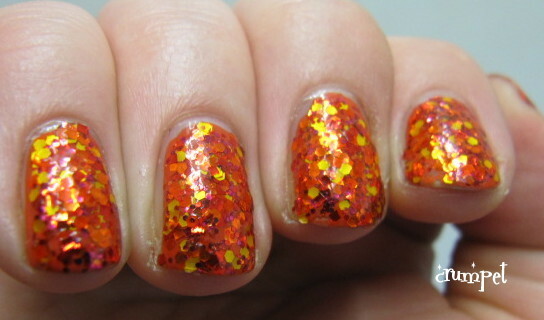 This is a clear base filled with yellow, red and orange glitter (which occasionally flashes pink). 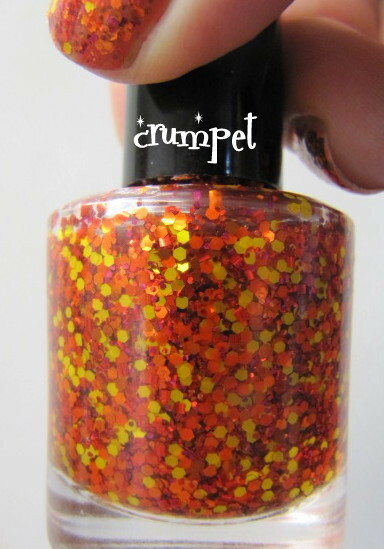 For my swatches I decided to go for the ultimate glitterbomb! 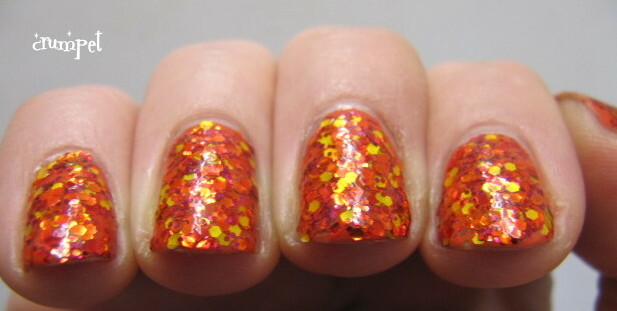 It took my 3 coats to reach opacity. 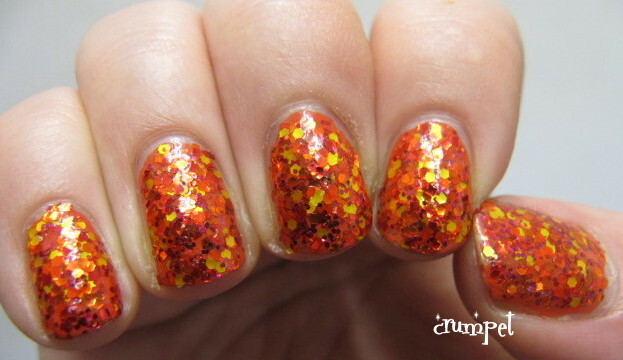 I think I prefer Cathy's swatches (here) which she layered over a coppery-bronze polish - it really allows the glitter to shine in all its glory. 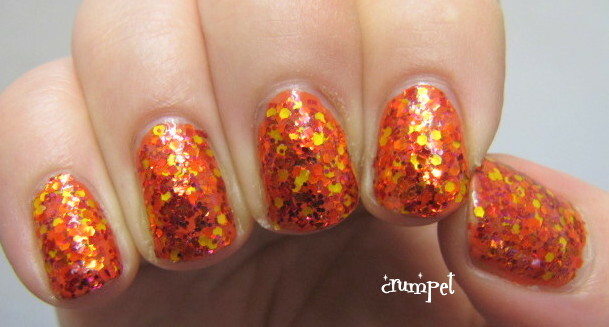 However, try and tell me mine doesn't look a great big pile of autumn leaves! Doesn't it look awesome layered so thickly? 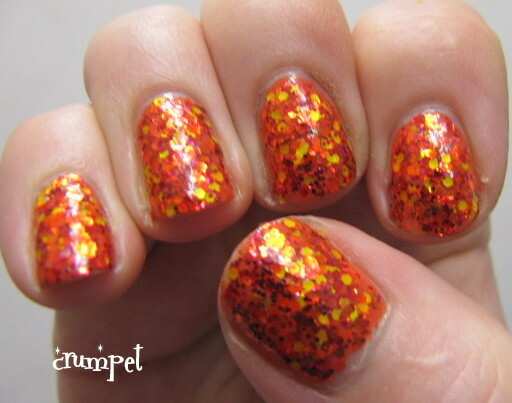 When I wore this, it was a hand-turner - I spent all day moving my hand by degrees to see what this light or that light did to the polish lol. Sensational. Not subtle, but WOW. 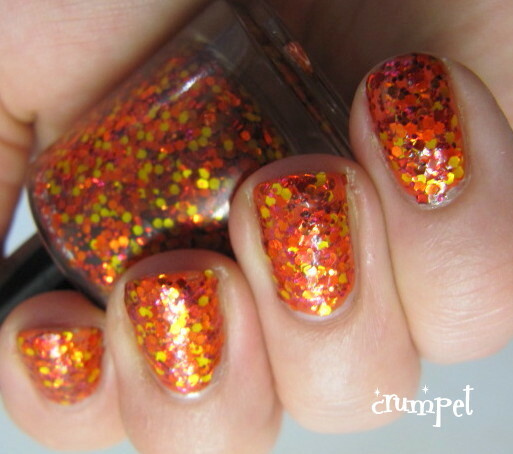 I love the poetry of this polish. 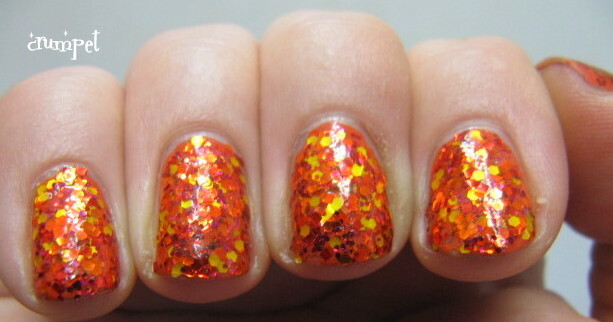 Again, this unlocks metaphors in me, and I LOVE polishes that do that! I think the autumn leaves metaphor is perfect, but it also reminds me of Fawkes the phoenix in Harry Potter. 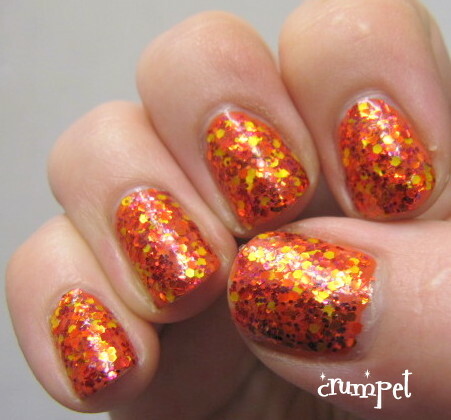 More than anything, this is poetic flame and lava, burning and swirling, molten on the nail, and so hot it blows the mind. 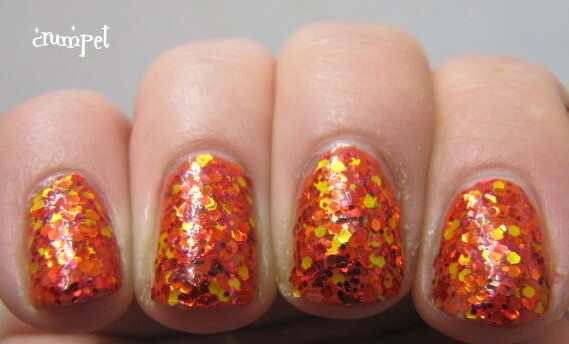 So, 3 layers of glitter - that must have been a nightmare to take off, no ? Well no, actually. I don't know how, but recently I seem to have hit on a formula where if I layer and TC my glitters thickly, I can just peel them off at the end of the day. I'm sure this isn't good for the nail, but it's a lot more fun than 10 minutes of foil lol. If you want to check out Glimmer by Erica, her Etsy is here and her Facebook is here. I bought this polish and 3 others (one of which I'm pretty sure I'll be wearing on my birthday, so that gives you a hint as to what colour it is lol) and you'll be seeing them soon.